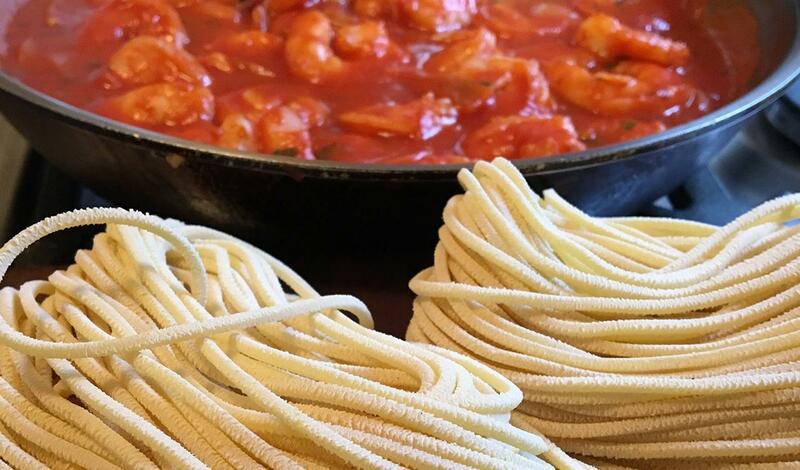 Shrimp Fra Diavolo is the perfect dish to celebrate Christmas Eve and the Festa dei Setti Pesce. Serve over fresh pasta or crusty bread. Toss the shrimp with the red pepper flakes, salt and pepper. Heat the oil in a heavy bottomed sauce pan. Add the shrimp in a single layer. Cook 80% through; remove and hold. Add the onion and cook until translucent. Add the garlic and cook 30 seconds more. Add the wine and reduce by 1/3. Crush the tomatoes by hand. Add to the pan and simmer for 10 minutes. Return the shrimp to the pan. Add the Knorr® Liquid Concentrated Base Chicken and herbs. Cook another 5 minutes until the shrimp are cooked through. Serve with pasta or crusty bread.